11/06/18 — Released Country Music on Broadway/Music City U.S.A.
01/15/19 — Sets Happy Birthday to Me, Hardbodies, Krull, Last Action Hero, Silent Rage and Who’s Harry Crumb? Wolfe announced this past week that writer/director Yen Tan’s internationally-acclaimed — and award-winning (Barcelona International Gay & Lesbian Film Festival, Champs-Élysées Film Festival, Dallas International Film Festival … and more — drama, 1985, will be available as both DVD and Blu-ray product offerings on Dec. 18. The film had its debut at the South by Southwest Film Festival in March of this year and immediately became a credit and festival attendee favorite. 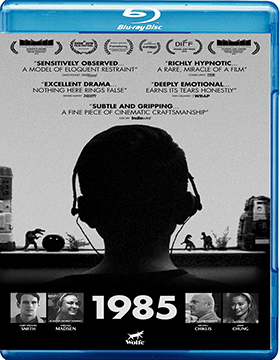 Indeed, 1985 would still be working the circuit, but Wolfe elected to bring filmmaker Yen Tan’s heartfelt story about a young advertising executive’s farewell trip home at Christmas to a wider audience during the Christmas-selling season. Adrian Lester (Cory Michael Smith — First Man, Wonderstruck … and as The Riddler in the Gotham television series) has it all, a fast-track future in advertising in New York City, but it is 1985 and the AIDS crisis is in full bloom and he is HIV positive — treatment is still over the horizon. He has already attended a half-dozen funerals and he has prepared himself mentally, if not emotionally, for what is to come. 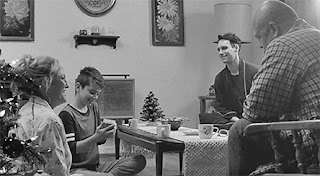 It’s Christmas and he heads home to spend the holidays with his mother, Eileen (Virginia Madsen — Sideways, Firewall, The Number 23, Lost Boy, etc. ), his father, Dale (Michael Chiklis — Emmy-winner for The Shield), and his young brother, Andrew (Aidan Langford). Also on the home front is high school sweetheart, Carly (Jamie Chung — Eden, The Hangover, Part II, Sucker Punch, etc.). His family is conservative and religious … his high school girlfriend is unaware. Adrian’s journey home is emotional rollercoaster … coming out and saying goodbye. Grab the Kleenex, it is required. 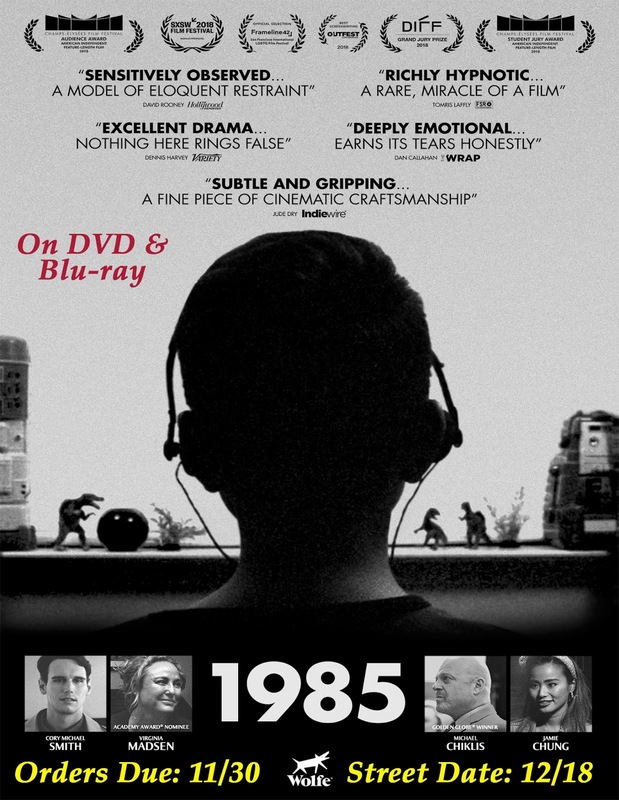 1985 is an indie film, but it is blessed with a magnificent cast — Cory Michael Smith brought along Gotham co-stars Jamie Chung and Michael Chiklis — add in Virginia Madsen and the glorious black and white photography by HutcH (aka: Hutch Crane — Some Beasts, Summer's Shadow, etc.) and you have a final product that totally belies its product budget. Bonus features included commentary from director/writer Yen Tan and producer/cinematographer HutcH and the 2016 short film titled 1985 that Yen Tan and HutcH worked on together.